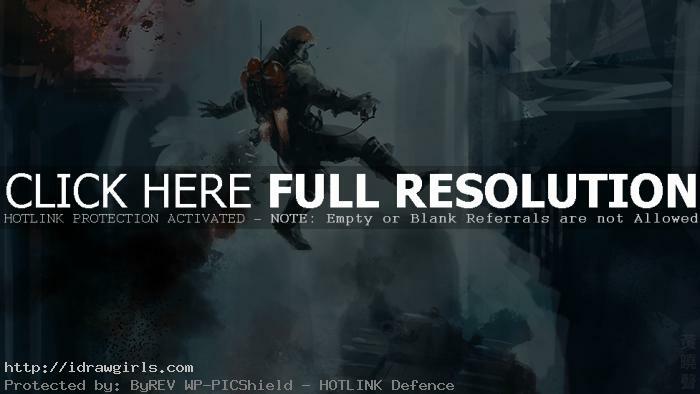 Digital painting tutorial soldier with jetpack concept art. This tutorial shows you my speedpainting process, how to paint soldier with jetpack. Usually I will have some sort of a story before I start painting. In this one, I am trying to create a scene of a soldier with jetpack got shot down by a WWI tank. You can scroll down further to see step by step images with instruction. I start with first using darker value to create the shape of the two buildings. Then a character floating in the air. I meant to define the main elements in the image first then slowly refine the painting according to the scene existing light and shadow. Here is a final image of a jet-pack soldier got shot down. Here are some speedpainting tips, though I am still trying to figure out myself. 1) Composition and big shapes. And try to give it a story. That’s already a lot to take on in 30 minutes. Keep it simple. Below are step by step digital painting process. More painting video tutorial you might be interested in.